November 7, 2013, Saitama, Japan – Tamron Co., Ltd. (President & CEO: Morio Ono), a leading manufacturer of precision optics, has announced the development of an innovative ultra-telephoto zoom lens with a focal length range of 150mm to 600mm for full-frame and APS-C format DSLR cameras. The lens sample will be on display in showcase at the Tamron booth at the Salon de la Photo 2013 which will be held from November 7 to 11 in Paris, France. This all-new ultra-telephoto zoom lens features VC ( Vibration Compensation)*² image stabilization, speedy, precise USD ( Ultrasonic Silent Drive)*³, state-of-the-art eBAND (Extended Bandwidth & Angular-Dependency) Coating*1, which significantly reduces the unwanted light reflections that cause flare and ghosting, and, in addition a sophisticated and stylish new external finish. Employing 20 elements in 13 groups and boasting an advanced optical design, it delivers a superior balance of resolution and contrast for sharp, clear images. The front group contains three LD ( Low Dispersion) glass elements (two in the first group, one in the third) for enhanced optical correction effectiveness, enabling the lens to thoroughly compensate for on-axis aberrations at the telephoto end. The lens also adopts eBAND Coating*¹, developed from state-of-the-art coating technologies, and conventional BBAR(Broad-Band Anti-Reflection) Coating to greatly suppress ghosting and flare even when shooting under adverse lighting conditions. VC ( Vibration Compensation)*² mechanism creates greater opportunities for sharper handheld photography. Tamron’s proprietary VC ( Vibration Compensation) image stabilization system uses a three-coil system, delivering significantly sharper images and creating greater opportunities for handheld ultra-telephoto photography. 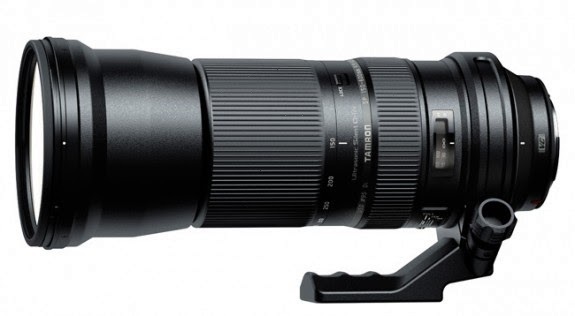 Tamron’s new SP 150-600mm F/5-6.3 Di VC USD features a USD ( Ultrasonic Silent Drive) ultrasonic motor drive*³ for swift and accurate AF response, it delivers high torque, very fast response times, and very low noise. The full-time manual focus mechanism allows users to make fine manual focus adjustments at any time even when AF is engaged.